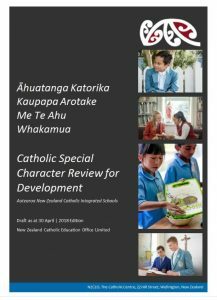 A Catholic Special Character review is designed to look at the work the school has done, in its internal evaluation and development, to grow Catholic Character. It affirms what the school has done and the opportunities for further development the school has discerned. It challenges the school to be more transformational. Reviewers encourage and commend best practice, and work with the school to analyse opportunities to further strengthen and develop the Catholic culture. This document provides a guide for schools and reviewers. Click here for a downloadable Word version. The appended Attestation Form may also be downloaded as a Word version by clicking here.